Visiting the Huntington Gardens the other day, my eye caught a bed of unusual roses. I have no idea what the names were but there were two colors and the effect was created by two different cultivars being grafted (or budded) onto the same bush. It was a bit of a novelty but we often plant complimentary plants together, so why not ensure they grow together. My knowledgeable friend Chad wonders whether these were 'Burgundy Ice' that had reverted back to 'Iceberg'. Interesting! Probably not as there was a row of these all showing a similar mixture of colors. Searching for this on the web, I found small standards advertised with just this mix as double grafts. 'Burgundy Ice' does however revert as the following picture shows. Grafting is of course an age-old process whereby one plant is united with the roots of another closely related plant, to generally give various benefits, such as vigor. However this example set me thinking about a few of the other novelty uses of grafting. In recent years gardeners may have noticed the resurgence of interest in grafted tomato plants - claiming to give extra vigor and disease resistance. 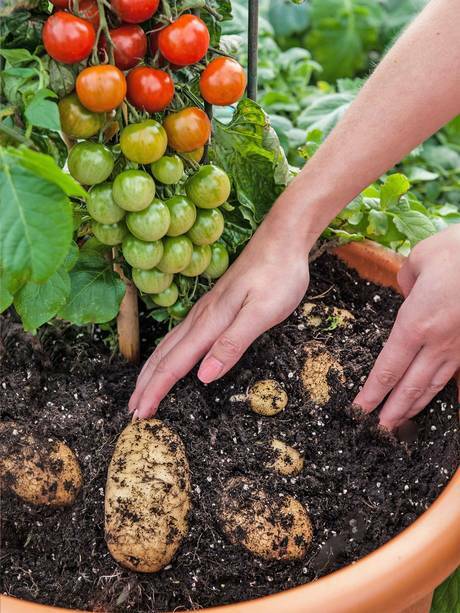 But did you know that because they are related, a tomato can be grafted onto a potato plant, giving a 'tomtato' with a double crop? 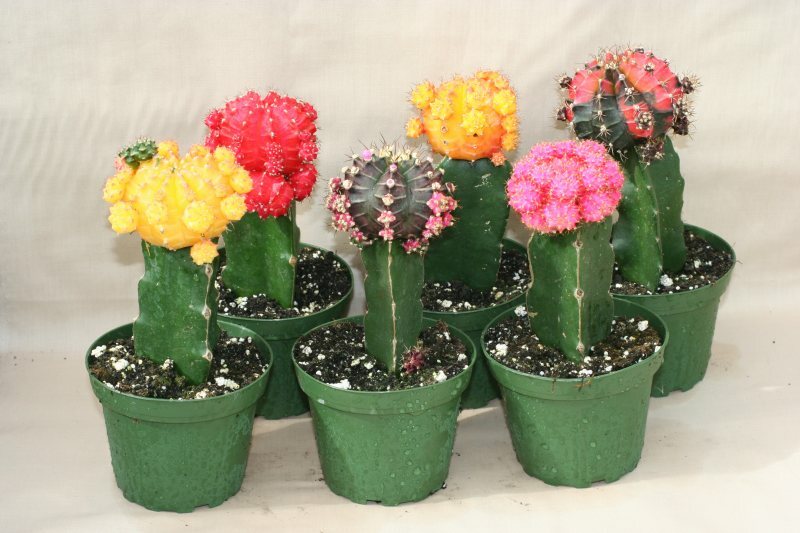 Another novel use of grafting if to create unsusual coloring and forms of cacti. I don't entirely understand the process and certainly don't appreciate the effects but there is a curiosity factor! The next example I am not too sure of. The chrysanthemums in the picture below were part of a fantastic exhibition of the Japanese art of training chrysanthemums, Kiku. (Check out my previous blog on this) I think this plant was probably created by grafting a new variety for each different colored tier. However it was grown, it is nevertheless an amazing specimen. Family fruit trees have been around for ages. 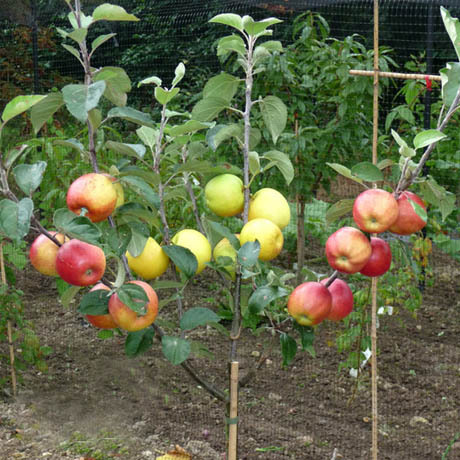 These are small trees that are grafted usually with three different cultivars of apple or pear which will in theory give a selection of fruit on maturity. My good friend Tony back in Nottingham has taken this to a new level by top-working an old apple tree with numerous different cultivars of apple. I forget how many but he has a whole orchard in one old tree. One of my favorite curiosity plants is +Laburnocytisus adamii which is a graft hybrid. Many years ago a French nurseryman grafted together a Laburnum with a broom, Cytisus purpurea, two loosely related plants. The result was a plant in which the tissues mingled completely and this is known as a graft hybrid, designated with the little + symbol before the name. When in flower, it produces yellow laburnum flowers, purple broom flowers and some murky pinkish blooms half-way in between. Back in the 80's I was responsible for the campus grounds at Reading University. 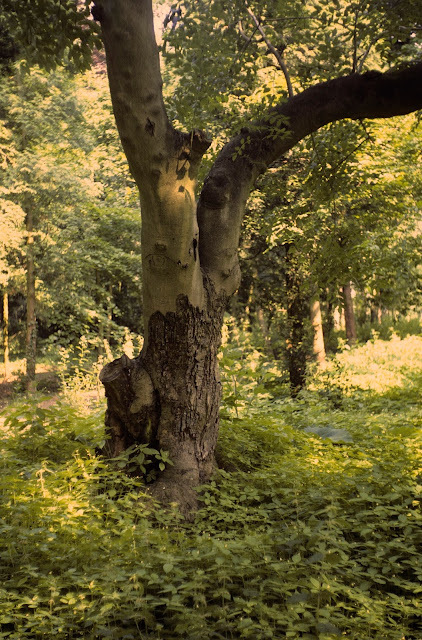 As part of a restoration project we discovered an old manna ash, Fraxinus ornus, in a woodland called The Wilderness. It had been part of a garden that once existed and the tree was described in great detail in an old Gardener's Chronicle article, somewhere around the 1900's. The text described the tree's graft line and its contrast between smooth and rough bark, above and below the graft line, so we knew that it was the one. We treasured the tree but one day I noticed it looked frail and gave instructions for the branches to be supported. Sadly I was too late as that night the tree collapsed. A sad ending for an old warrior! Are you sure the rose was double budded? It looks like 'Burgundy Ice' reverting back to 'Iceberg'. That is interesting in itself. I never understood why 'sports' tended to break back to the original form rather than to something else. In DNA heredity it didn't make sense. Now we have 'epigenetics' and it makes much more sense. The DNA hasn't changed in the sport, only a switch which can flip back again. Family fruit trees sell well, but seldom prosper. The choice of variety is usually to please the market rather than to make a good tree. 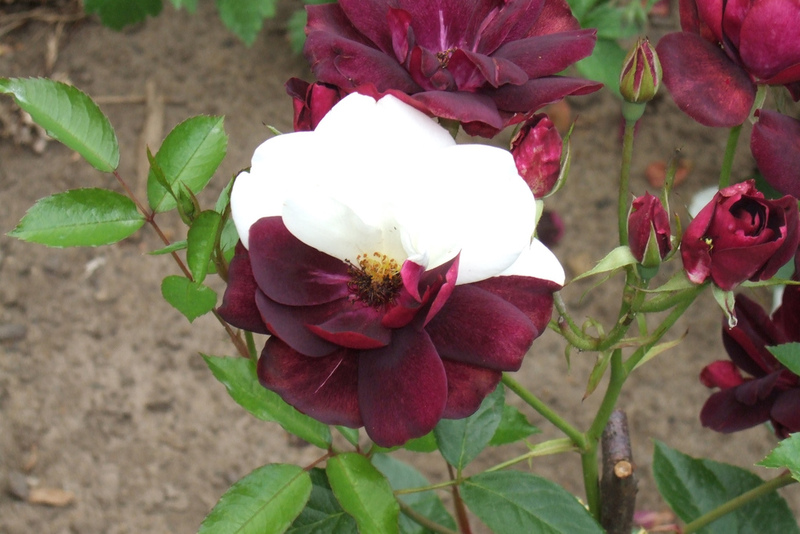 Complementary for pollination but very closely matched for vigour might work, but all too often they are the varieties of the moment grafted together. Pruning branches that are mismatched for vigour is a real challenge. If it is a row of them then they must be intentional. In that case the comment should have been on how wise to graft two varieties identical in vigour and only differing in colour; a variety and its colour sport!